Lemmings do not commit mass suicide. It's a myth, but it's remarkable how many people believe it. Ask a few. "It's a complete urban legend," said state wildlife biologist Thomas McDonough. "I think it blew out of proportion based on a Disney documentary in the '50s, and that brought it to the mainstream." Lemmings are a kind of short tailed vole, a mouse-like rodent that favors tundra and open grasslands. 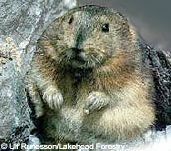 Three kinds are found in Alaska, including the collared lemming, the only rodent that turns white in winter. In 1958 Walt Disney produced "White Wilderness," part of the studio's "True Life Adventure" series. "White Wilderness" featured a segment on lemmings, detailing their strange compulsion to commit mass suicide. 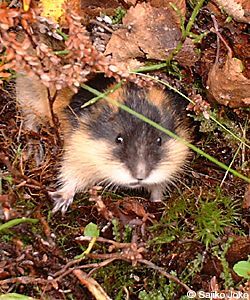 According to a 1983 investigation by Canadian Broadcasting Corporation producer Brian Vallee, the lemming scenes were faked. The lemmings supposedly committing mass suicide by leaping into the ocean were actually thrown off a cliff by the Disney filmmakers. The epic "lemming migration" was staged using careful editing, tight camera angles and a few dozen lemmings running on snow covered lazy-Susan style turntable. "White Wilderness" was filmed in Alberta, Canada, a landlocked province, and not on location in lemmings' natural habitat. There are about 20 lemming species found in the circumpolar north - but evidently not in that area of Alberta. So the Disney people bought lemmings from Inuit children a couple provinces away in Manitoba and staged the whole sequence. In the lemming segment, the little rodents assemble for a mass migration, scamper across the tundra and ford a tiny stream as narrator Winston Hibbler explains that, "A kind of compulsion seizes each tiny rodent and, carried along by an unreasoning hysteria, each falls into step for a march that will take them to a strange destiny." That destiny is to jump into the ocean. As they approach the "sea," (actually a river -more tight cropping) Hibbler continues, "They've become victims of an obsession -- a one-track thought: Move on! Move on!" The "pack of lemmings" reaches the final precipice. "This is the last chance to turn back," Hibbler states. "Yet over they go, casting themselves out bodily into space." Life-loving lemming: lemmings do not commit mass suicide, although in lean times they may become cannibalistic. These mouse-like rodents are found in Alaska and in northern countries around the world, mostly favoring tundra and open grassland. Lemmings are seen flying into the water. The final shot shows the sea awash with dying lemmings. Certainly, some scenes in nature documentaries are staged. In Sir David Attenborough's recent documentary, "The Life of Birds," the close-up footage of a flying duck, filmed razor-sharp from the bird's wingtip, was shot from a car using a mallard drake trained to fly alongside the car. But faking an entirely mythical event is something else. "Disney had to have gotten that idea from somewhere," said Thomas McDonough, the state wildlife biologist. Disney likely confused dispersal with migration, he added, and embellished a kernel of truth. Lemming populations fluctuate enormously based on predators, food, climate and other factors. Under ideal conditions, in a single year a population of voles can increase by a factor of ten. When they've exhausted the local food supply, they disperse, as do moose, beaver and many other animals. Lemmings can swim and will cross bodies of water in their quest for greener pastures. Sometimes they drown. Dispersal and accidental death is a far cry from the instinctive, deliberate mass suicide depicted in "White Wilderness," but Hibbler explains that life is tough in the lemmings' "weird world of frozen chaos." The voice-over implies that lemmings take the plunge every seven to ten years to alleviate overpopulation. "What people see is essentially mass dispersal," said zoologist Gordon Jarrell, an expert in small mammals with the University of Alaska Fairbanks. "Sometimes it's pretty directional. The classic example is in the Scandinavian mountains, where (lemmings) have been dramatically observed. They will come to a body of water and be temporarily stopped, and eventually they'll build up along the shore so dense and they will swim across. If they get wet to the skin, they 're essentially dead." "There's no question that at times they will build up to huge numbers," Jarrell added. "One description from Barrow does talk about them drowning and piling up on the shore." Jarrell said when people learn that he works with lemmings, the mass suicide issue often comes up. "It's a frequent question," he said "'Do they really kill themselves?' No. The answer is unequivocal, no they don't."